Hatching Dinosaur Egg | Pi'ikea St. 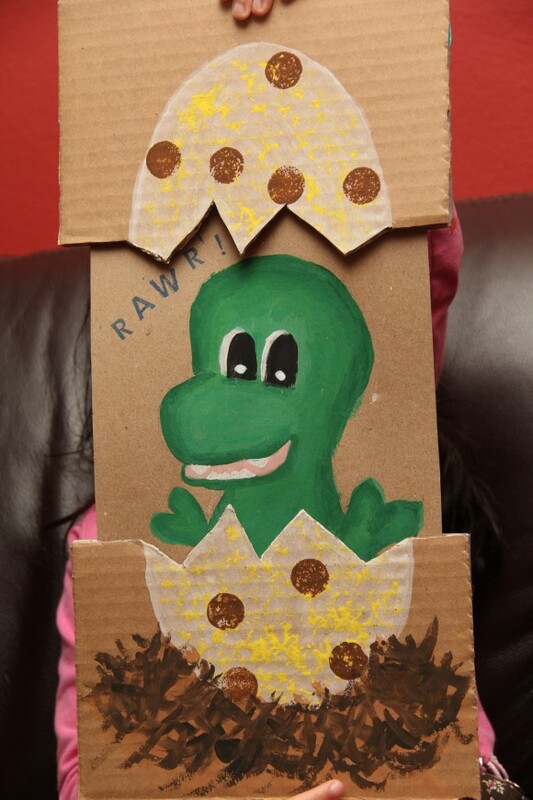 This project is ideal for those kiddos who are obsessed with dinosaurs. You can easily replace the baby dino with another reptile, of course. But who can resist the sweet, innocent face of a newborn T-Rex? 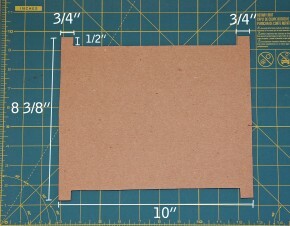 Cut cardboard into two 8 ½” x 11” rectangles and three 3/8” x 8 ½” strips. With 1 of the 3/8” strips, cut four 1” long pieces and discard the remaining strip. Cut a piece of card stock (thickest you can find) into an 8 3/8” x 10 rectangle. Then cut the card stock according to the dimensions below. 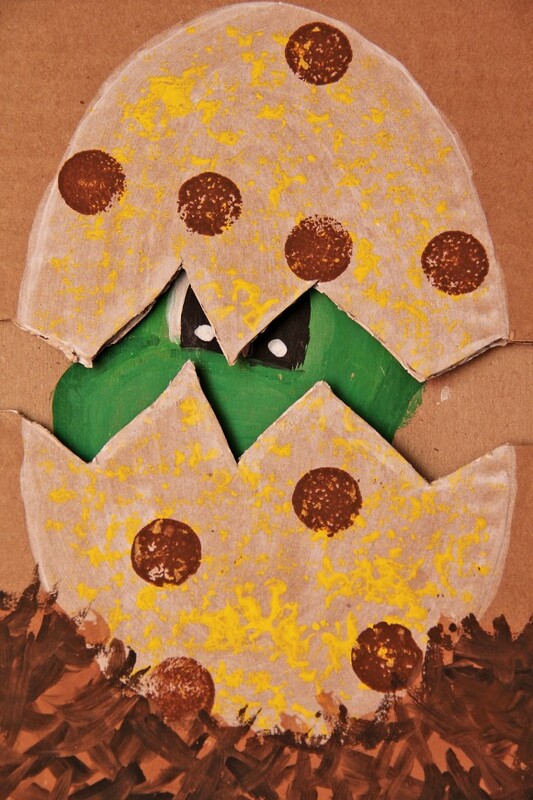 On one of the larger cardboards, draw your egg and nest. This will be the front panel. 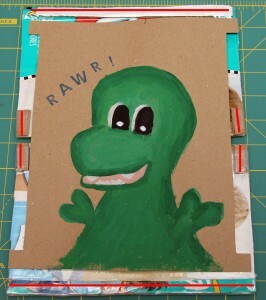 Also, draw your baby dinosaur on the card stock. You can use paints or whatever your kids are most comfortable drawing with. If you do use paints, be sure to allow it to dry before proceeding. Cut your back panel in half widthwise. Then with your front panel, use a craft knife and begin to cut in half widthwise. 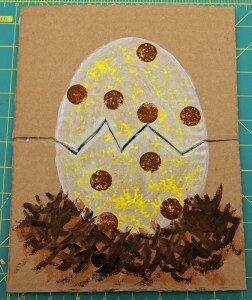 Once you reach the egg, make zigzag cuts until you reach the end of the egg. Finish with a straight cut to the end of the panel. To assemble, first lay the back panel down. 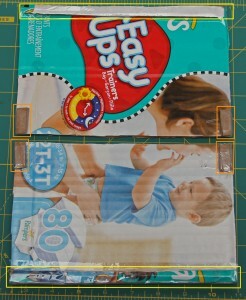 Using double-sided tape, stick on one 3/8” x 8 ½” cardboard strip along the top and bottom edge (boxed in yellow in picture below). And stick on a 1” cardboard strip at each corner near the middle cut (boxed in orange). Use regular tape to secure these pieces down. Now lay your card stock on top of your back piece, picture side up. Place double sided tape as indicated by the red lines in the picture below. 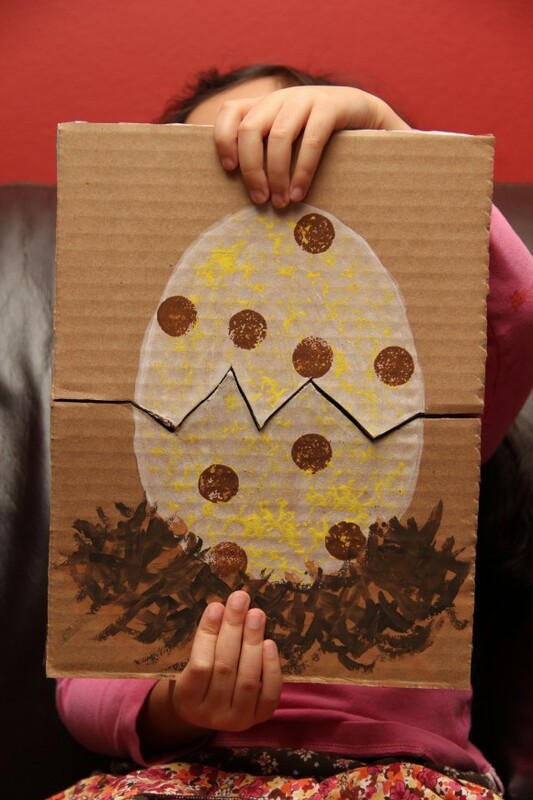 Finally, carefully place on the top and bottom front panels with egg picture side up. Firmly press down on the taped spots. You can add more tape to seal the edges but may need to run the craft knife down the openings on the side so the inner card stock can move freely. Your hatching dinosaur is now complete. Isn’t it cute? It’s time to think of a name.